Nokia has named Stephen Elop, former president of Microsoft's business software group, to become its new CEO effective from later this month. Elop will replace Olli-Pekka Kallasvuo in the top job on Sept. 21. Kallasvuo loses his board seat with immediate effect and will step down from the CEO position on Sept. 20, Nokia said. Elop will leave Microsoft immediately, that company said. The reshuffle comes as the world's largest cell-phone maker battles to compete with companies such as Apple and Research in Motion. While the company continues to enjoy good sales of low-end phones, analysts have faulted Nokia's smartphone line-up as weak compared to the competition. While hardware quality is important in any phone, smartphones are much more about software. "Nokia has traditionally been strong in hardware, but has been found wanting in software," said Ben Wood, director of research at CCS Insight. Elop could be the man to change that, according to Wood: "Kallasvuo is a very bright guy, but he has a law degree. Now the guy who will head up the business has a computer science degree. He will bring software expertise to the business." While hardware vendors in Europe, and later Asia, led the mobile phone industry in the early years, "A lot of the agenda is now being set on the West coast of the U.S. by Apple, Google and so on," Wood said. 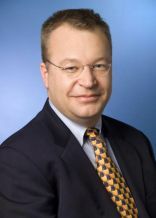 Elop's awareness of that market, and his relationships there, are likely to help Nokia boost its performance, he said. In its most recent quarter, the period from April through June, Nokia reported lackluster earnings and sales. Profits dropped about 40 percent year-on-year to €227 million, which was significantly below analyst expectations, and cell-phone shipments were weak at 111.1 million units. "His appointment brings to an end the ongoing speculation about the leadership at Nokia," Woods said. "The time is right to accelerate the company's renewal; to bring in new executive leadership with different skills and strengths in order to drive company success," Jorma Ollila, chairman of Nokia, said in a statement. "The Nokia Board believes that Stephen has the right industry experience and leadership skills to realize the full potential of Nokia. His strong software background and proven record in change management will be valuable assets as we press harder to complete the transformation of the company." The timing is interesting as the announcement comes just before Nokia's biggest event of the year, Nokia World, taking place in London next week. Kallasvuo is scheduled to deliver the keynote speech there, but anything he says about the company's future strategy may well be swept away when Elop takes over, Woods said. Elop brings Nokia a wealth of executive experience from the business and multimedia software sector. In his current position at Microsoft he oversees the company's Microsoft Office systems and has helped shape the software company's overall strategy. He was previously chief operating officer at Juniper Networks and served as president of worldwide field operations at Adobe Systems. He was president and CEO of Macromedia until its acquisition by Adobe in 2005. "I am extremely excited to become part of a team dedicated to strengthening Nokia's position as the undisputed leader of the mobile communications industry, with a relentless focus on meeting the needs and expectations of customers," he said in the Nokia statement.